Be warned. Your day just got made! 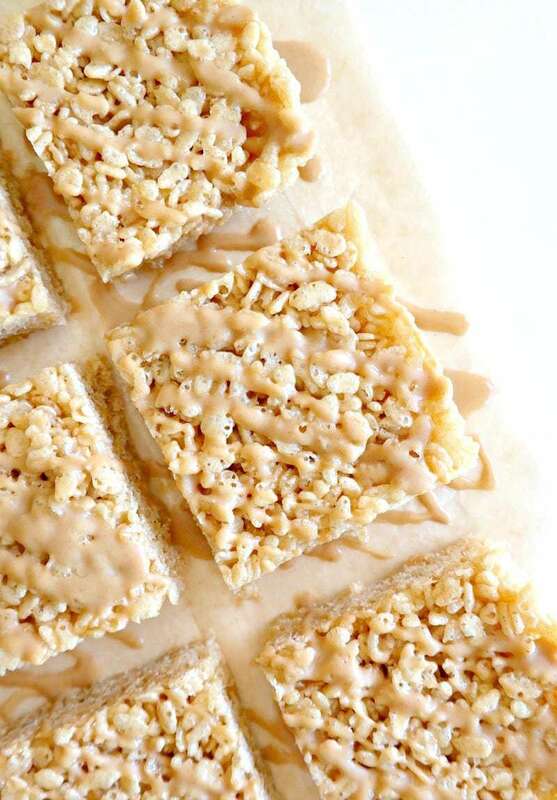 We’re going all out with some sticky peanut butter hippie krispies (<< cutest name ever, no?). 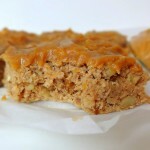 Could also win the title of pillowy, rich, caramel-y PB squares. 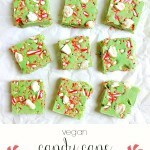 These are Rice Krispies, revamped in the best possible way, as they’re a healthier vegan version! Don’t be fooled though, I made sure to bring a rich peanut butter caramel-y taste… I mean… is there anything better? Before these, I hadn’t had a rice krispie treat in I don’t know how long?! Probably since those blue shiny wrapped packaged and processed rice krispies treats that most kids know and love. 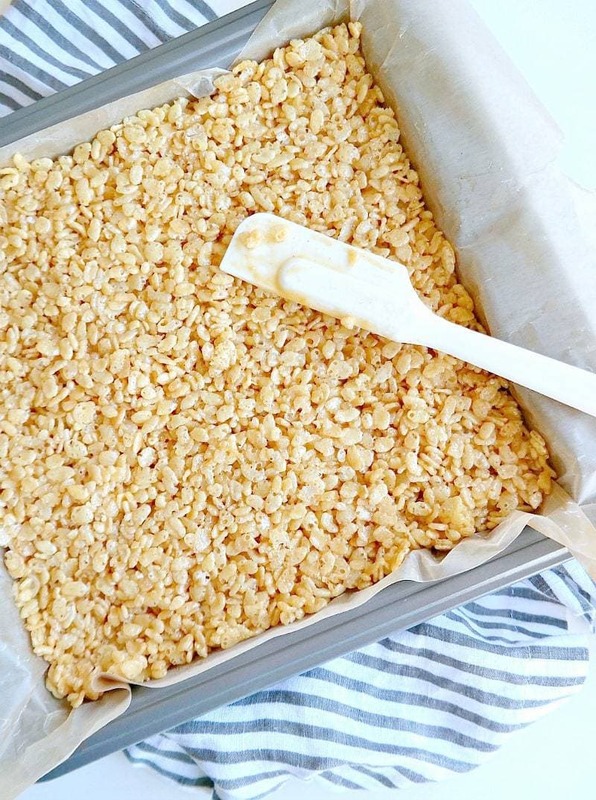 Something jogged my memory that I’ve been wanting to re-create a rice krispies treat recipe for quite a while… so here they are! Just think: sweet, buttery and gooey with a hint of dreamy peanut butter and a good airy crunch. Wait, what? Krispie treats without marshmallows? Yep. While vegan marshmallows exist and you could use them if you prefer (get them here , there’s also a pumpkin flavor, say what?) I wanted to share a recipe without a processed ingredient because that’s what we’re all about here. We can all do without the processed junk. Plus, you won’t even notice a difference without the marshmallows. TRUST ME. It doesn’t even matter. 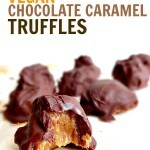 They are held together with brown rice syrup and peanut butter instead. Brown rice syrup is all sorts of amazing as it’s super smooth yet thick and sticky which makes it a perfect alternative to honey (for vegans) and keeps them from getting dry. This is also where these hippie krispies get their caramel-like flavor from. So caramel-y! If you have a peanut allergy, swap the peanut butter for almond butter or sunflower butter. Oil or butter is not even necessary for these sticky squares of heaven! I’ve gone one step further too… with drippy peanut butter shell drizzle. YESS. Of course it’s optional, but I mean, why not. Toppings make everything better. 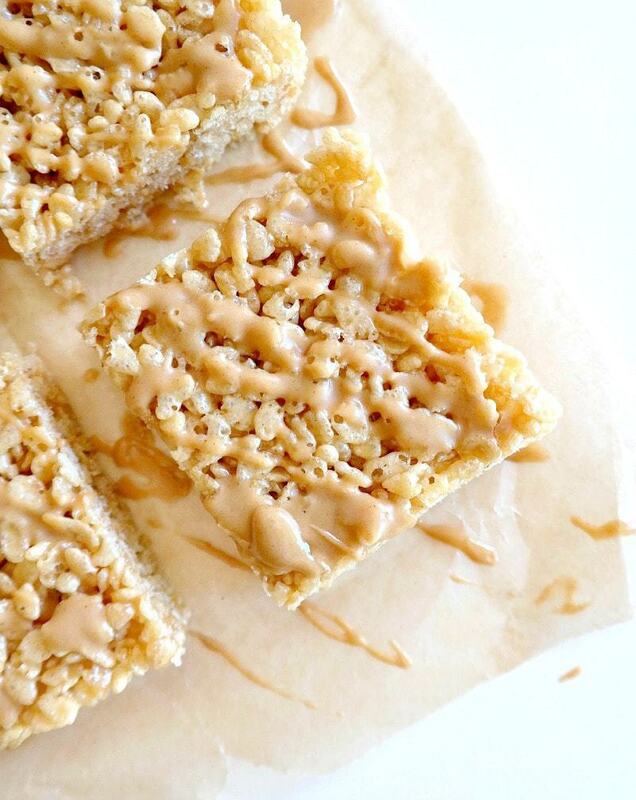 The PB drizzle takes 5 seconds to make and you’ll fall in love with these hippie krispies even more. Most of all, they’re ready so fast, you’ll freak! I use this peanut butter – it’s raw, organic and unsalted! Place the brown rice syrup and maple syrup in a large pot over medium heat. Bring to a rolling boil and cook for 1 minute, stirring often, being careful not to burn. Turn off heat and whisk in the peanut butter and vanilla, until smooth. Stir in the rice crisp cereal until thoroughly combined (can also mix in a large bowl, which I find to be easier. Simply add rice crisps to a large bowl and stir in the liquid until well combined. Scoop into pan and spread out evenly. Press down with lightly wet fingers or a spatula. Place in freezer to set for 10 minutes while you make the Peanut Butter Drizzle. In a separate small microwaveable bowl, mix together the peanut butter and maple syrup. Microwave in 30 second intervals just to warm, for easier mixing. Add 1 teaspoon water at a time, if needed. Mix until super smooth! 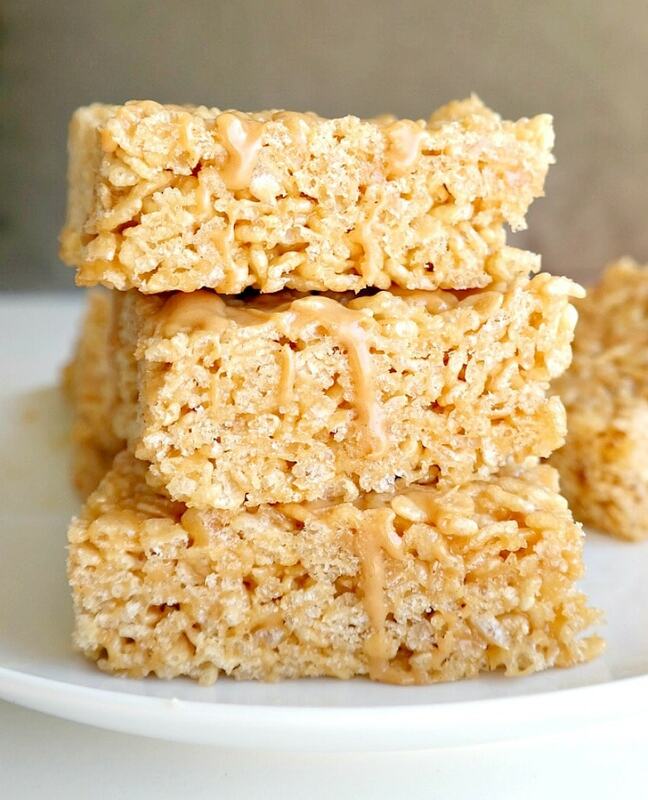 Remove krispies from freezer and drizzle on the peanut butter. Place back in the freezer for 10 minutes or until firm. Slice into squares. Bars will hold their shape quite well at room temperature, but they can be stored in the fridge too. Wrap up leftovers and store in the fridge for 5 to 7 days, or in the freezer for up to 1 month. These get even better the next day, enjoy! *Can sub peanut butter for almond butter or sunflower seed butter. **An 8×8 square pan is fine too; they will just be a little thicker! With Halloween coming up, I’d say these would make for the perfect homemade treat! While I don’t observe any of the man-made holidays, I do have a concern about making these for halloween; unless they’re meant for a party in someone’s home, they shouldn’t be handed out to kids at the door. No parent in their right mind would allow their child to eat something homemade anymore, not with the dangerous things the crazies of this world put into them/it (specifically halloween treats). I don’t mean you’re crazy–I wouldn’t have a clue about that, never having met you–but there are very sick minds out there, and kids need to be protected. I meant homemade treats for you at home during Halloween/fall season or anytime really… not to hand out for Halloween. Not sure where you would get that from! This is such a beautiful recipe. Thank you! Can I substitute brown rice syrup and maple syrup with honey? Unless specified, crispy rice cereal is not gluten free due to the malt flavoring they use. 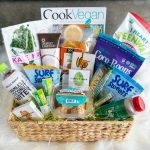 If you need them to be gluten free, make sure you buy gf crispy rice cereal! These look great!! Hi! These are amazing. We couldn’t create a drizzle though. It was more of a spread, is this a recipe? Hi Cat, it is a recipe, just add a bit more water until it reaches your desired consistency. 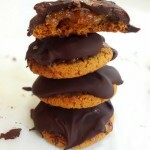 Not all peanut butter is the same consistency-wise! totally drooling over these right now! 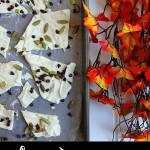 I think I need to make these this weekend I mean it IS Halloween weekend! 😉 plus I actually have brown rice syrup in my fridge right now! 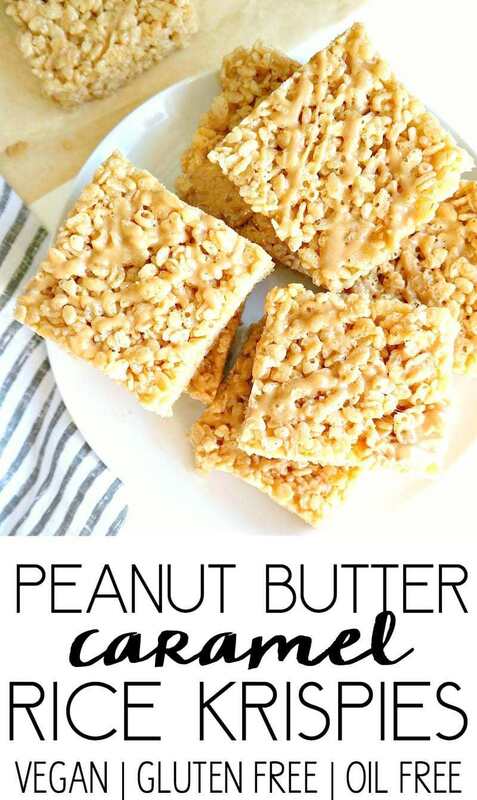 😉 and I totally love that you put peanut butter in here too this is definitely my kind of krispie bars!